JPEG (Joint Photographic Experts Group) is an image compression file format primarily intended to keep file sizes small. It is typically intended for web pages, but can be used for high quality 4-color printing, provided that some basic qualifications are met. Be aware that the colors you see on your LCD or computer monitor may not accurately reflect the colors when the file is printed in CMYK on our 4-color press. If you are concerned about color, visit our Monitor Calibration and Printing Profiles to calibrate your monitor to our press. You can also mail us a color proof and we will determine whether your digital file will match or not (there may be additional costs to adjust your color to match). Beware of interpolating the image. 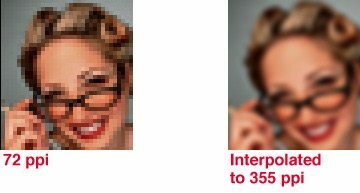 Interpolation means that you are asking the computer to calculate the pixels that are not there (the original image is low resolution at 72 dpi, but you use Photoshop to “bump up” the number to 355 dpi). Computers cannot add new data to sharpen the image. They can only add pixels that “fill the gaps.” What you end up with is a tiff that is at 355 dpi, but very, very blurry. Resolution: Digital cameras measure image resolution in Mega Pixels. At Modern Postcard, we recommend at least a 2.4 Mega Pixel camera for a standard size postcard and a 4.8 Mega Pixel camera for a deluxe size postcard. Color: Most digital cameras take an RGB image and do not convert it in the camera to CMYK (some very high-end models do this conversion in the camera). In other words, the colors you see on your LCD or computer monitor will not accurately reflect the colors when the file is printed in CMYK on our 4-color press. If you are concerned about color and you have Adobe Photoshop, visit our Monitor Calibration and Printing Profiles to calibrate your monitor to our press. You can also mail us a color proof and we will determine whether your digital file will match or not (there may be additional costs to adjust your color to match). In the example below, the quality is set to “fine.” Your camera may display something similar. *Some cameras also support uncompressed TIFF as an option. If your camera has this option, consider using it for your print jobs as it is even better image quality than high-quality JPEG. Resolution: Most stock photography companies offer various options for each image they supply. Some offer high quality, high resolution JPEG files* either over the internet or on CD-rom. Be sure to select the highest quality JPEG file(s) for use when printing to a 4-color press. Color: Most stock photography is in RGB color mode and will have to be converted to CMYK before final printing. Be aware that the colors you see on your computer monitor will not accurately reflect the colors when the file is printed in CMYK on our 4-color press. If you are concerned about color and you have Adobe Photoshop, visit our Monitor Calibration and Printing Profiles to calibrate your monitor to our press. You can also mail us a color proof and we will determine whether your digital file will match or not (there may be additional costs to adjust your color to match). 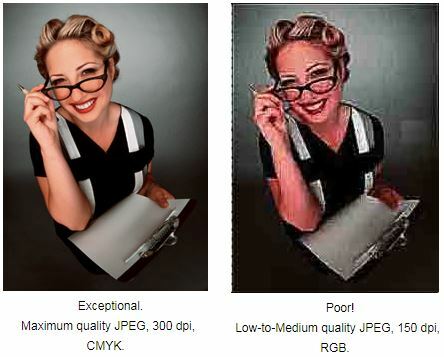 JPEG Quality: Like the resolution issue above, stock photography uses various levels of JPEG compression. Be sure to select images described as “High,” “Fine,” or “Maximum” quality. *Some stock photography companies offer uncompressed TIFF as an option. If they do, consider using it for your print jobs as it is even better image quality than high-quality JPEG.